Conversion Sciences is a teaching organization. For every client website that we improve, we want 1000 more to be improved through the conversion optimization events where we teach. 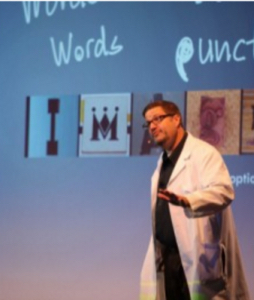 Brian Massey speaking at a conversion optimization event in Germany. We present and teach about conversion optimization online and live, at conferences, universities, and corporations. Come. Join us and enjoy the fruits of a high-converting online business. Join us and make your website profitable and enjoyable to visit. We make mundane topics and make them accessible, even fun. We appear in our signature lab coats on stage and online (Yes, we wear them in the lab, too). Our topics include Getting Past the Bouncers in Your Brain, Mobile Judgement Day and How to be the JJ Abrams of Website Redesign. Invite us speak at your online marketing event. We do workshops, conference sessions, keynotes and custom corporate training. Book our scientists for your next event.